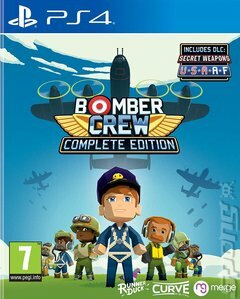 Bomber Crew is a World War 2 strategic bombing sim, where keeping your crew alive is just as important as completing the objective, as death is permanent! Assemble your very own unique crew from countless procedurally generated recruits. Or get personal and customise your crew's names and appearance! Upgrade, customise and name your trusty aircraft - even create your own nose art! The right balance of reliability and fire-power is crucial for successful bombing raids! Take to the skies, through enemy fighters, flak and other deadly hazards to reach your target. An historically-inspired campaign awaits you and your brave crew! The chances of surviving a full tour of duty are slim, but heroism will not be forgotten! Your fearless crews will be immortalised as they take their places in the memorial.